It's an indoor air-conditioned theme park - no sweating in the heat and no need to worry about rides being closed due to rain. 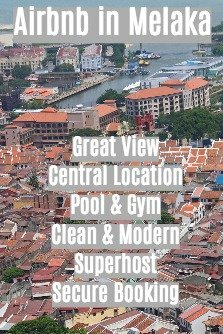 It's centrally located in Times Square shopping mall in the heart of KL and conveniently accessed by public transport. 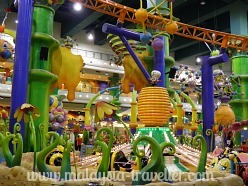 It's in a huge mall so a trip to the theme park can be combined with shopping, dining or watching a movie. 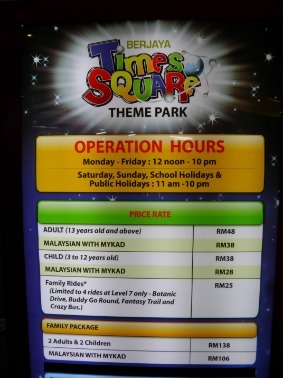 There is a separate section for younger kids with reduced pricing so you don't have to pay for rides which younger kids are unable to use. It's not busy even on a Saturday afternoon but it gets more crowded during school holidays. 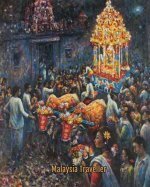 Overall the positives outweigh the negatives - it is well worth visiting. 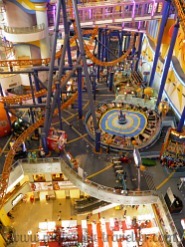 The Supersonic Odyssey is claimed to be Asia's longest indoor roller coaster. It has upside down loops and can reach speeds of 80kph. Thrilling stuff! Ooort's Express is a fun merry ground that takes passengers for a fast and bumpy ride. Botanic Drive (kids 'drive' in jeep-like buggies. Molly Cool's Swing (a tame Pirates Galleon type attraction). Monday - Friday 12pm - 10pm. Saturday, Sunday, Public Holidays and School Holidays 11am - 10pm.